Igneous rocks are formed when molten rock (magma) cools and solidifies, with or without crystallization, either below the surface as intrusive (plutonic) rocks or on the surface as extrusive ( volcanic) rocks. This magma can be derived from partial melts of pre-existing rocks in either the Earth's mantle or crust. Typically, the melting is caused by one or more of the following processes -- an increase in temperature, a decrease in pressure, or a change in composition. Over 700 types of igneous rocks have been described, most of them formed beneath the surface of the Earth's crust. The word "igneous" is derived from the Latin igneus, meaning "of fire". Rocks may melt in response to a decrease in pressure, to a change in composition such as an addition of water, to an increase in temperature, or to a combination of these processes. Other mechanisms, such as melting from impact of a meteorite, are less important today, but impacts during accretion of the Earth led to extensive melting, and the outer several hundred kilometers of our early Earth probably was an ocean of magma. Impacts of large meteorites in last few hundred million years have been proposed as one mechanism responsible for the extensive basalt magmatism of several large igneous provinces. Decompression melting occurs because of a decrease in pressure. The solidus temperatures of most rocks increase with increasing pressure in the absence of water (The solidus temperature of a rock at a given pressure is the maximum temperature below which that rock is completely crystalline.). Experimental studies of appropriate peridotite samples document that the solidus temperatures increase by 3°C to 4°C per kilometer. Peridotite at depth in the Earth's mantle may be hotter than its solidus temperature at some shallower level. If such rock rises during the convection of solid mantle, it will cool slightly as it expands in an adiabatic process, but the cooling is only about 0.3°C per kilometer. The rock may rise far enough so that its temperature is at the solidus at that shallower depth. If the rock rises higher, it will begin to melt. Melt droplets can coalesce into larger volumes and be intruded upwards. This process of melting from upward movement of solid mantle is critical in the evolution of the earth. Decompression melting creates the ocean crust at mid-ocean ridges. Decompression melting caused by the rise of mantle plumes is responsible for creating ocean islands like those of the Hawaiian islands. Plume-related decompression melting also is the most common explanation for flood basalts and oceanic plateaus (two types of large igneous provinces), although other causes such as melting related to meteorite impact have been proposed for some of these huge volumes of igneous rock. The change of rock composition most responsible for creation of magma is the addition of water. Water lowers the solidus temperature of rocks at a given pressure. For example, at a depth of about 100 kilometers, peridotite begins to melt near 800°C in the presence of excess water, but near or above about 1500°C in the absence of water (Grove and others, 2006). Water is driven out of the ocean lithosphere in subduction zones, and it causes melting in the overlying mantle. Hydrous magmas of basalt and andesite composition are produced directly and indirectly as results of dehydration during the subduction process. Such magmas and those derived from them build up island arcs such as those in the Pacific ring of fire. These magmas have contributed much of the material to form continental crust. The addition of carbon dioxide is relatively a much less important cause of magma formation than addition of water, but genesis of some silica-undersaturated magmas has been attributed to the dominance of carbon dioxide over water in their mantle source regions. In the presence of carbon dioxide, experiments document that the peridotite solidus temperature decreases by about 200°C in a narrow pressure interval at pressures corresponding to a depth of about 70 km. Magmas of rock types such as nephelinite, carbonatite, and kimberlite are among those that may be generated following an influx of carbon dioxide into a mantle volume at depths greater than about 70 km. Increase of temperature is the most typical mechanism for formation of magma within continental crust. Such temperature increases can occur because of the upward intrusion of magma from the mantle. Temperatures can also exceed the solidus of a crustal rock in continental crust thickened by compression at a plate boundary. The plate boundary between the Indian and Asian continental masses provides a well-studied example, as the Tibetan Plateau just north of the boundary has crust about 80 kilometers thick, roughly twice the thickness of normal continental crust. Studies of electrical resistivity deduced from magnetotelluric data have detected a layer that appears to contain silicate melt and that stretches for at least 1000 kilometers within the middle crust along the southern margin of the Tibetan Plateau (Unsworth and others, 2005). Granite and rhyolite are types of igneous rock commonly interpreted as products of melting of continental crust because of increases of temperature. Temperature increases also may contribute to the melting of lithosphere dragged down in a subduction zone. As magma cools, minerals typically crystallize from the melt at different temperatures ( fractional crystallization). As minerals crystallize, the composition of the residual melt typically changes. If crystals separate from melt, then the residual melt will differ in composition from the parent magma. For instance, a magma of gabbro composition can produce a residual melt of granite composition if early formed crystals are separated from the magma. Gabbro may have a liquidus temperature near 1200°C, and derivative granite-composition melt may have a liquidus temperature as low as about 700°C. Incompatible elements are concentrated in the last residues of magma during fractional crystallization and in the first melts produced during partial melting: either process can form the magma that crystallizes to pegmatite, a rock type commonly enriched in incompatible elements. Bowen's reaction series is important for understanding the idealised sequence of fractional crystallisation of a magma. in some special circumstances they host important mineral deposits ( ores): for example, tungsten, tin, and uranium, are commonly associated with granites, whereas ores of chromium and platinum are commonly associated with gabbros. In terms of modes of occurrence, igneous rocks can be either intrusive (plutonic) or extrusive ( volcanic). Intrusive igneous rocks are formed from magma that cools and solidifies within the earth. Surrounded by pre-existing rock (called country rock), the magma cools slowly, and as a result these rocks are coarse grained. The mineral grains in such rocks can generally be identified with the naked eye. Intrusive rocks can also be classified according to the shape and size of the intrusive body and its relation to the other formations into which it intrudes. Typical intrusive formations are batholiths, stocks, laccoliths, sills and dikes. The extrusive types usually are called lavas. The melt, with or without suspended crystals and gas bubbles, is called magma. Magma rises because it is less dense than the rock from which it was created. When it reaches the surface, magma extruded onto the surface either beneath water or air, is called lava. Eruptions of volcanoes under the air are termed subaerial whereas those occurring underneath the ocean are termed submarine. Black smokers and mid ocean ridge basalt are examples of submarine volcanic activity. Magma which erupts from a volcano behaves according to its viscosity, determined by temperature, composition, and crystal content. High-temperature magma, most of which is basaltic in composition, behaves in a manner similar to thick oil and, as it cools, treacle. 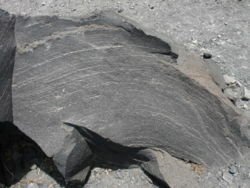 Long, thin basalt flows with pahoehoe surfaces are common. Intermediate composition magma such as andesite tends to form cinder cones of intermingled ash, tuff and lava, and may have viscosity similar to thick, cold molasses or even rubber when erupted. Felsic magma such as rhyolite is usually erupted at low temperature and is up to 10,000 times as viscous as basalt. Volcanoes with rhyolitic magama commonly erupt explosively, and rhyolitic lava flows typically are of limited extent and have steep margins, because the magma is so viscous. Felsic and intermediate magmas that erupt often do so violently, with explosions driven by release of dissolved gases -- typically water but also carbon dioxide. Explosively erupted material is called tephra, and volcanic deposits are called pyroclastic, and they include tuff, agglomerate and ignimbrite. Fine volcanic ash is also erupted and forms ash tuff deposits which can often cover vast areas. Because lava cools and crystallizes rapidly, it is fine grained. If the cooling has been so rapid as to prevent the formation of even small crystals after extrusion, the resulting rock may be mostly glass (such as the rock obsidian). Because the minerals are fine-grained, it is much more difficult to distinguish between the different types of extrusive igneous rocks than between different types of intrusive igneous rocks. Generally, the mineral constituents of fine-grained extrusive igneous rocks can only be determined by examination of thin sections of the rock under a microscope, so only an approximate classification can usually be made in the field. Igneous rock are classified according to mode of occurrence, texture, mineralogy, chemical composition, and the geometry of the igneous body. In a simplified classification, igneous rock types are separated on the basis of the type of feldspar present, the presence or absence of quartz, and in rocks with no feldspar or quartz, the type of iron or magnesium minerals present. Rocks containing quartz (silica in composition) are silica-oversaturated. Rocks with feldspathoids are silica-undersaturated, because feldspathoids cannot coexist with quartz. An igneous rock with larger, clearly discernable crystals embedded in a finer-grained matrix is termed porphyry. Porphyritic texture develops when some of the crystals grow to considerable size before the main mass of the magma crystallizes as finer-grained, uniform material. Texture is an important criterion for the naming of volcanic rocks. The texture of volcanic rocks, including the size, shape, orientation, and distribution of grains and the intergrain relationships, will determine whether the rock is termed a tuff, a pyroclastic lava or a simple lava. However, the texture is only a subordinate part of classifying volcanic rocks, as most often there needs to be chemical information gleaned from rocks with extremely fine-grained groundmass or which are airfall tuffs which may be formed from volcanic ash. Textural criteria are less critical in classifying intrusive rocks where the majority of minerals will be visible to the naked eye or at least using a hand lens, magnifying glass or microscope. Plutonic rocks tend also to be less texturally varied and less prone to gaining structural fabrics. Textural terms can be used to differentiate different intrusive phases of large plutons, for instance porphyritic margins to large intrusive bodies, porphyry stocks and subvolcanic apophyses. Mineralogical classification is used most often to classify plutonic rocks and chemical classifications are preferred to classify volcanic rocks, with phenocryst species used as a prefix, eg; "olivine-bearing picrite" or "orthoclase-phyric rhyolite". Note: the acid-basic terminology is used more broadly in older geological literature. For volcanic rocks, mineralogy is important in classifying and naming lavas. The most important criteria is the phenocryst species, followed by the groundmass mineralogy. Often, where the groundmass is aphanitic, chemical classification must be used to properly identify a volcanic rock. Granite is an igneous intrusive rock (crystallized at depth), with felsic composition (rich in silica and with more than 10% of felsic minerals) and phaneritic, subeuhedral texture (minerals are visible for the unaided eye and some of them retain original crystallographic shapes). Granite is the most abundant intrusive rock that can be found in the continents. Volcanic rocks are named after Vulcan, the Roman name for the god of fire.